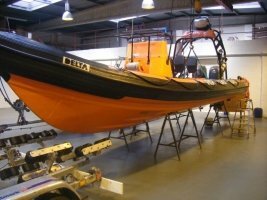 We design and manufacture 6.5M, 7M and 7.5M a rigid inflatable rib boat. The Vacuum Infusion manufacturing process involves the use of Light Resin Transfer Moulding (“Light RTM”) which is most commonly used in the development of high-quality marine product, Aeromotive components, wind turbines and automotive components. We are the first company in Ireland to use the innovative new Vacuum Infusion technology to manufacture rigid inflatable boats (RIBs). The image to the right is our very own manufactured RIB, the AC650. This Rib Boat mould and the transfer process used to apply it is extremely durable and resistant to many conditions. 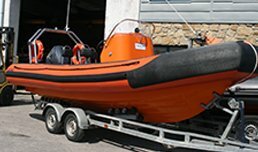 We also carry out repairs and refurbishments of rigid inflatable boats including tube repairs, engine refurbishments and hull overhauls. What are the Benefits of a RIB? Rigid inflatable boats (RIBs) have become increasingly popular in Ireland in the last 20 years. RIBs have proven their ability to withstand the Irish sea by positioning themselves as the safest, sea-worthy boats due to their lightweight, high capacity and high-performance structure. RIBs are designed with a solid shaped hull and flexible tubes along the gunwale. Why Buy a RIB or Rib Boat? The Rib Boat or RIBs inflatable collar and durable materials allow the vessel to maintain its float even in deep seas and poor weather conditions. As a development of the inflatable boat, RIBs offer high-speed manoeuvrability and are less vulnerable to low-speed impact collisions. RIBs are most commonly used by passenger carriers such as rescue services, police, military, boat patrol, lifeguards, divers and for various leisure purposes such as cruising. We offer a 5-year warranty on all of our manufactured Rib boats to give you peace of mind in knowing that we strive to provide excellent quality RIB boat for all of our customers. To find out more about designing your own custom RIB boat or to begin the process, contact us today on 087 2209632.